I think making films deals with something more important than a role and/or being only a woman director. I only try to be the best I am as a human being. The plan's really simple. Maiden and I will be using this thread to explore a few female filmmakers that have been on our radar for a while. We have a preliminary list of filmmakers all ready to go but if things go well, we'll expand the list gradually. Suggestions are more than welcome, especially if you can make a compelling case for them. We'll be discussing 3 (or thereabouts) films per filmmaker and we won't be starting our discussion till we're done with all 3 films. The hope is that discussing all 3 in combination might allow us to get a broader perspective of the filmmaker's style, thematics and so on. The discussions will take place in real-time over on this very thread hopefully with broader participation. A priori, we have no particular reason to think that gender issues are likely to come up. It's certainly not our intent to approach these films/filmmakers with that lens taking precedence. However, if it does come up, we're not opposed to discussing it per se. We plan on keeping the thread updated well in advance with the names of the filmmakers and specific films in the hope that others can watch and join in the discussion. Pls contact me if you have availability issues and I'll do my best to help. Well, this is my favorite thread. Thanks for the interest, guys. We're really excited to finally do this! 1961 has worked out of the Odessa Film Studio. Muratova's unmistakable style and her penchant for "small"
Charulata and I are going to start the series by viewing and discussing four films by Kira Muratova. I've been itching to see more by her ever since LEAVES convinced me to watch Passions last year. I'm hoping to gain some context for that absurdist comedy and am eager to see her delve into darker territory. I did consider having us watch something less frivolous in place of Passions, but I'm hoping it will provide value as contrast. Plus, I'm looking forward to hearing how Char compares it to something like Daisies, which she was able to appreciate and I wasn't. Of course, we want to hear from others, too, so we won't begin the actual discussion for a few days, in order to give anyone who's interested a chance to see a film or two first. Update: The Muratova discussion begins here. Btw, boys are allowed to play along too. 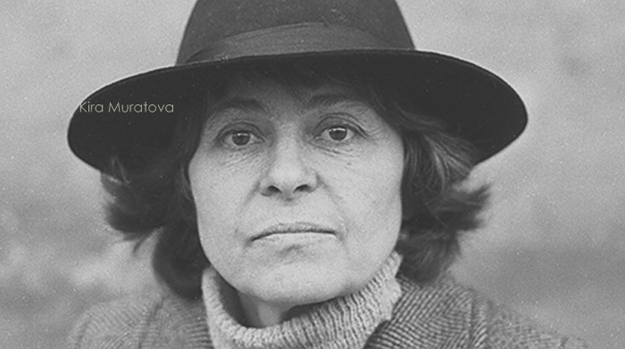 Also, we are planning to begin our Muratova discussion on June 23rd. charulata wrote: Btw, boys are allowed to play along too. Colonel Kurz wrote: Can we? As long as you shower regularly and aren't smelly! I saw The Asthenic Syndrome a few years ago. I didn't understand it. Circus Freak wrote: I saw The Asthenic Syndrome a few years ago. I didn't understand it. Perfect. Re-watch and discuss it with us? Don't try to change me, baby. Colonel Kurz wrote: Don't try to change me, baby. Haha! I was going to tell Char not to raise the bar too high. We need some testosterone to balance out all this estrogen. And that bar is so high. Colonel Kurz wrote: And that bar is so high. It's no wonder none of my relationships work out . I almost said, "I've never heard of her!" and then it hit me. Colonel Kurz wrote: Insurmountable bars... of soap. Hahaha . Plus, bar soap is ew. Am sure Maiden already regrets making this a joint thread with me! He's such a pig, that Vasco. JediMoonShyne wrote: He's such a pig, that Vasco. Not as bad as that guy from Italy who keeps rubbing new Reygadas in everyone's face. Well sure, but you shouldn't use soap you find in bars. Colonel Kurz wrote: Well sure, but you shouldn't use soap you find in bars. Did you learn that from a Tom Waits song? Sure, from a Tom Waits song. We totally had you in mind when we picked Menkes <3. What kind of insult is this?! I love Speed Racer, and I'm not joking. Someday you're going to break my heart, you know that. Well, I love Speed Racer. Eye candy! Go girls, Speed Racer is so good. I'm going to do my best to keep up with this thread by watching all of these films. I'm not great at discussion so I'm not sure how much I'll bring to the table though. Willow wrote: I'm going to do my best to keep up with this thread by watching all of these films. I'm not great at discussion so I'm not sure how much I'll bring to the table though. You really don't have to post walls of text or anything. Just letting us know if you liked the films or not and mentioning anything that stands out or that you think might be worth talking about more will make for great support <3. Cool. Very much have been meaning to see more Akerman. This will make me so happy! The discussion means more if others have seen the films! Also, what Char said. I was getting this weird feeling of déjà vu, too. 17.5 months, impressive. Then again, we weren't really friends back then, were we? Okay, I grabbed The Asthenic Syndrome and Three Stories off of KG and I added Passions to the top of my netflix queue. Willow wrote: Okay, I grabbed The Asthenic Syndrome and Three Stories off of KG and I added Passions to the top of my netflix queue. I don't believe it! Netflix has two by Muratova now?! I didn't even think to check, because they'd had none when I last looked. This Speed Racer love is heartwarming. I've seen one Muratova from her earlier period, but sadly there's no subs for that. Turns out I was wrong, and my half-hearted attempts to make subs for that one were finally supplanted by someone competent. Also, apparently, it was featured in The Story of Film. If you shall get that one (Dolgie provody, BTW), let me know, I've never really discussed it with anyone and I wouldn't mind a re-watch if I watch other Muratova films to go along with it.